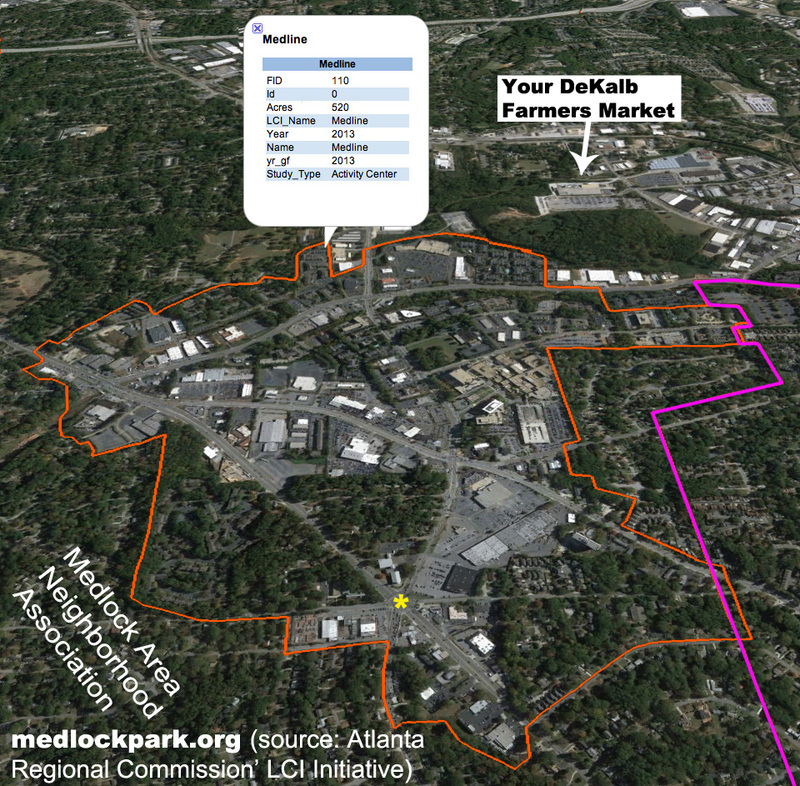 "focuses on the area around DeKalb Medical Center and will plan for redevelopment of underutilized and vacant properties to create a variety of housing options and an appropriate mix of commercial, office and retail. The study will incorporate Lifelong Communities concepts and the establishment of a “wellness district” for the DeKalb Medical Center area. Additionally, the plan will address sidewalk and bicycle facilities along the major corridors in the area to create a more walkable center and to improve connections to MARTA bus routes and Emory’s Cliff shuttle." Medline LCI (orange boundary), per Atlanta Regional Commission's Google Earth map. Pink line marks the City of Decatur Town Center study boundary. A yellow asterisk marks the Medlock/North Decatur/Scott Blvd intersection, relative to which the Scott Blvd. Baptist Church is almost at 12 o'clock. Suburban Plaza more or less spans 1-3 o'clock. Click to enlarge. The Medline study will not be ready in time to steer the redevelopment of Suburban Plaza or of the Scott Blvd. Baptist Church property. Even so, these projects have and will continue to face scrutiny by County planning and review by the Commissioners, whose decisions will be informed by the goals of the Medline LCI study. Community discussions about the Medline LCI study will begin soon, once the contractor who will lead the study is hired.